Over the past few years, I've found that January and February have become two of my favorite months for entertaining. The buzz and expectations of the holidays have died down, and created the perfect opportunity for relaxed and cozy gatherings with friends. No need to worry about things like gifts or decorations or even elaborate recipes; it's now just about simple, good things to eat in the company of your loved ones. What could be better than that?! It's also a great opportunity to reinforce new friendships or connections made during the holidays. Did you, for example, meet a cool couple at a dinner party? Or chat with a colleague from a different department at the office holiday luncheon? 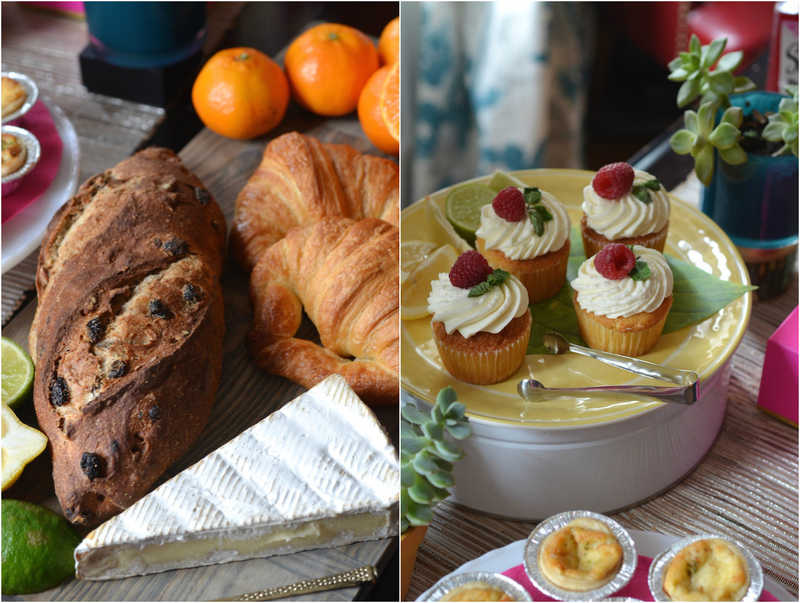 Why not reach out now and invite them over for a casual brunch at home? In the spirit of the New Year, it's the perfect time to create new experiences and relationships. It could mean the difference between creating an awesome new friend, or just fading off and never talking again. I was recently inspired to do just that, thanks to the help of Simply Beverages. I've long been a fan of their lemonade and orange juice, so when they asked me to collaborate with them on a sponsored post featuring their new line of refreshing, all natural fruit juice drinks in three flavors (Mixed Berry, Tropical, and Fruit Punch), I jumped at the chance! 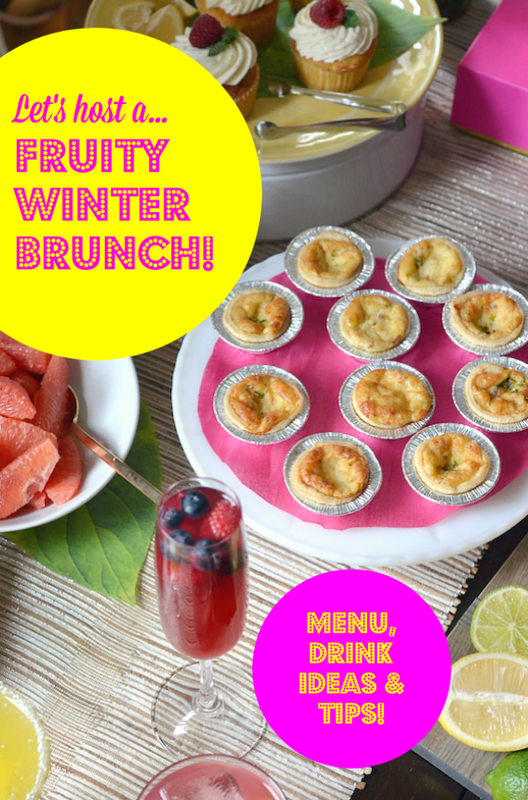 I knew it would be the perfect start for a fun winter brunch party menu to share with all of you. 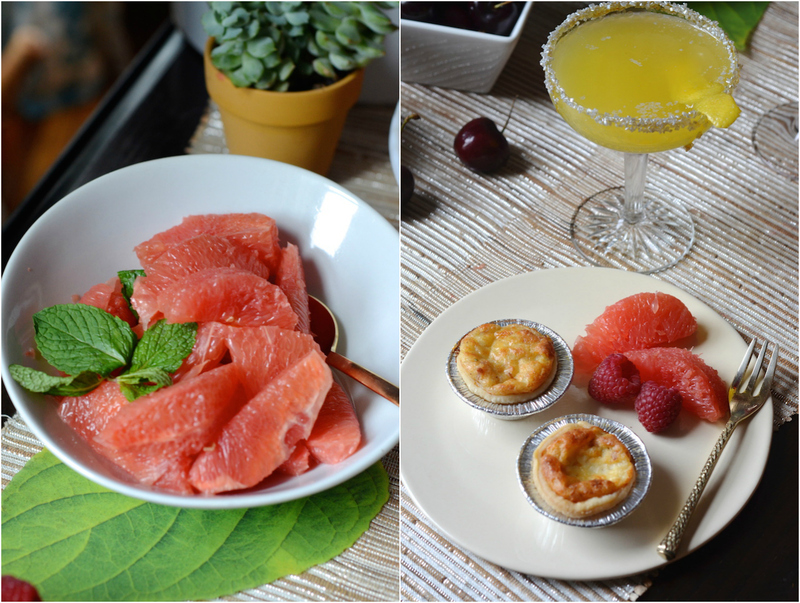 Since January is the time of year when many folks like to swear off alcohol or make other healthier choices, I used the juice drinks to create three beautiful and refreshing "mocktails," just by adding some fun and simple garnishes. No need to be a fancy mixologist! 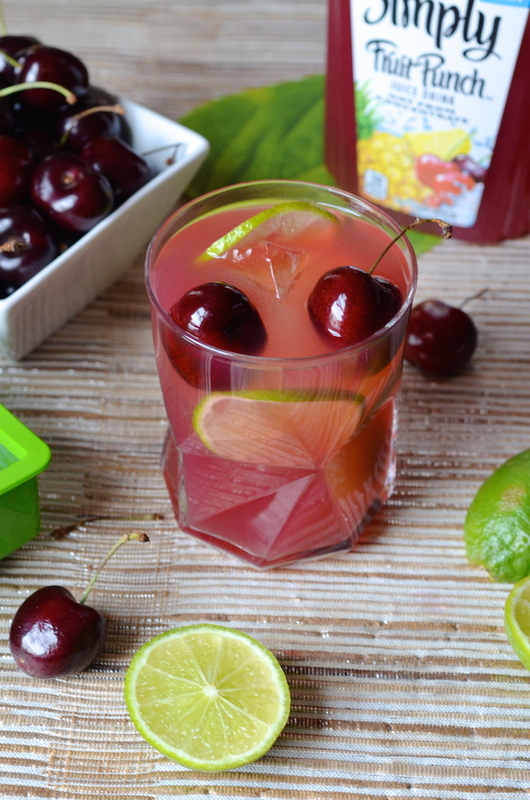 Made with real fruit juice, these drinks already taste fantastic on their own, which means all you need to do is pour them into a pretty glass, add a few simple touches, and you have something that looks gorgeous and elegant, with barely any additional effort! 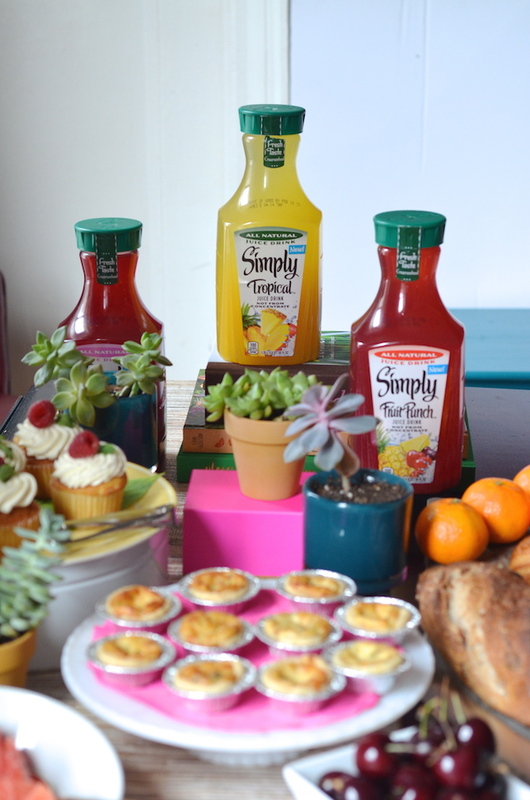 Using the juice drinks as inspiration, I created an easy party menu celebrating bright, fruity flavors. 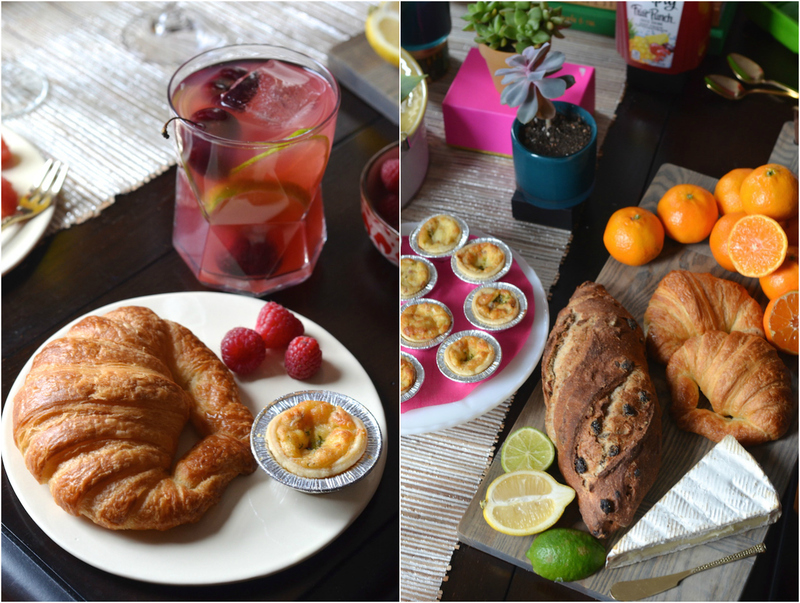 Along with the beverages, I created a simple brunch spread featuring mini bite-sized quiches, fresh citrus and berries, croissants, and warm crusty cranberry walnut bread served with soft cheeses. 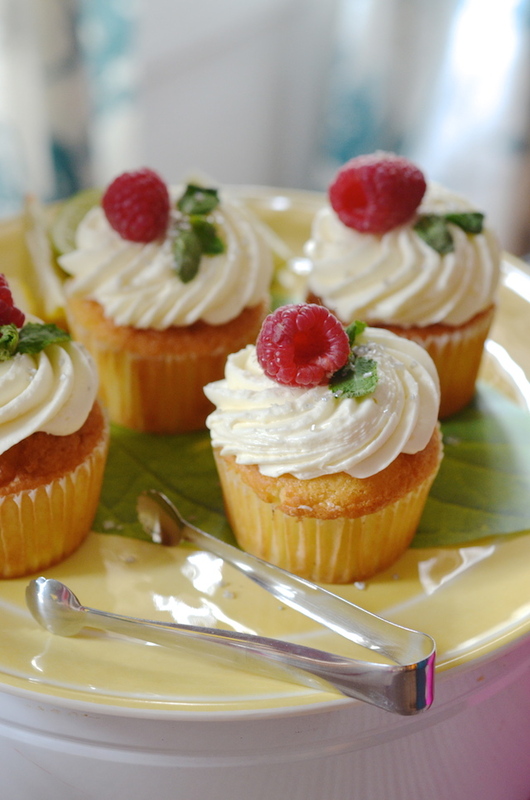 For dessert, I served a plate of pretty raspberry cupcakes garnished with sparkly sugar and fresh mint! Instead of fancy decorations or flowers, I decorated the table with some simple succulent plants in small pots. Super easy, pretty, and the perfect wintery touch (don't they look almost like tiny pine trees?!) After the party, you can send each of your guests home with one of these, or keep them to decorate your home (they last forever and are SO easy to care for). Simple, colorful, and the perfect backdrop to an afternoon of chatting and snacking with friends both old and new! 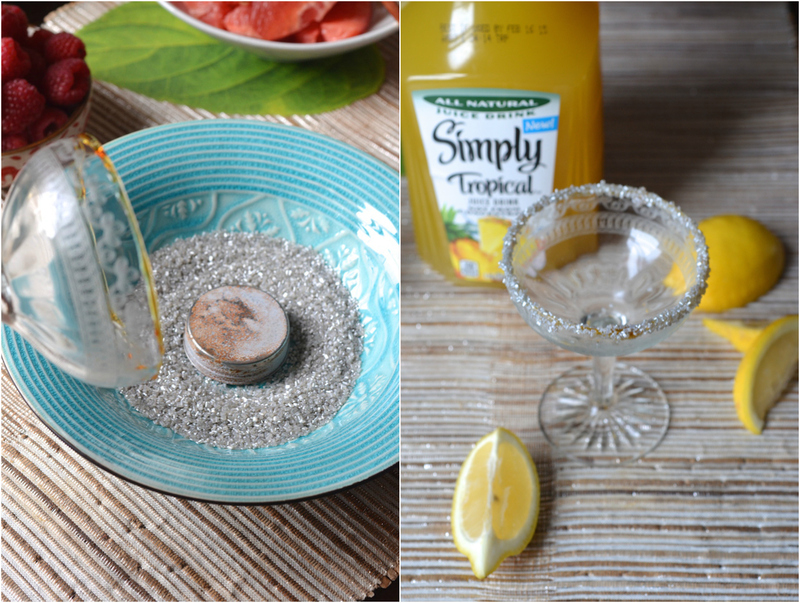 Below are tips on how I dressed up my beverages. Just because there isn't any alcohol, doesn't mean you should skimp on the special touches! 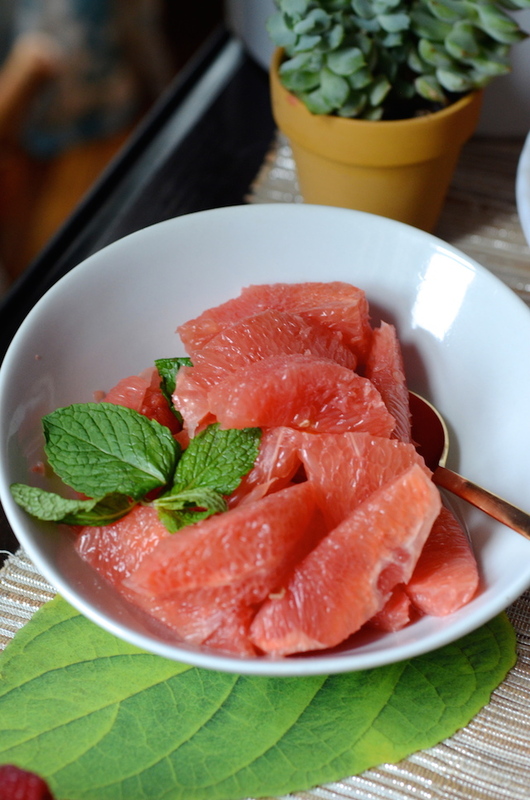 A simple, delicious juice + some fresh garnishes = a perfect beverage to serve party guests. 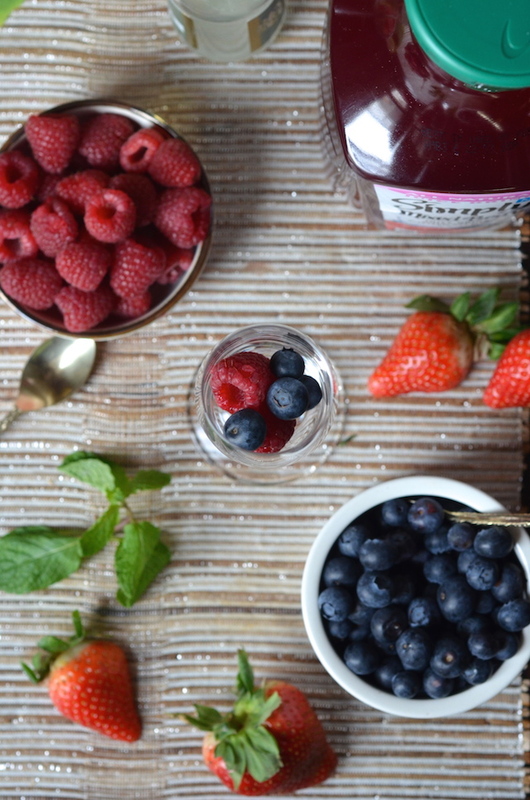 I added freshly washed raspberries and blueberries to tall flute glasses, then topped it off with chilled Simply Mixed Berry Juice Drink. A simple garnish of fresh mint finished it off! 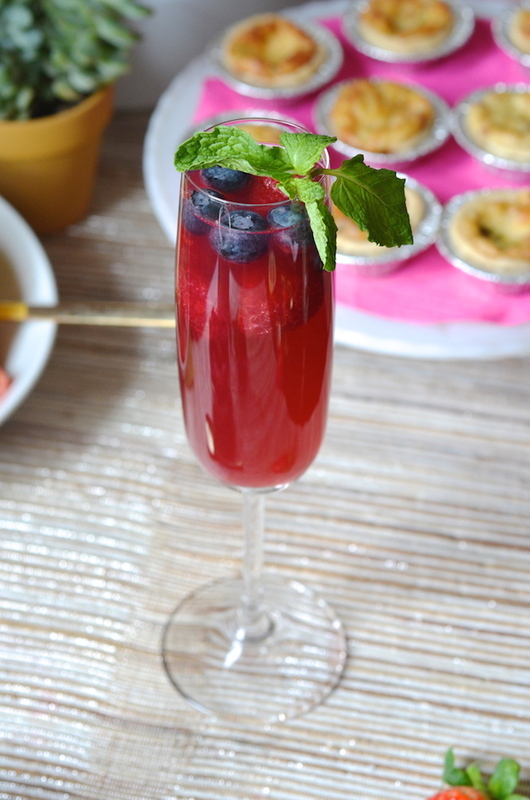 Note that you can prepare these in advance, or leave out bowls of fresh berries and mint so that your guests can personalize their own beverages. 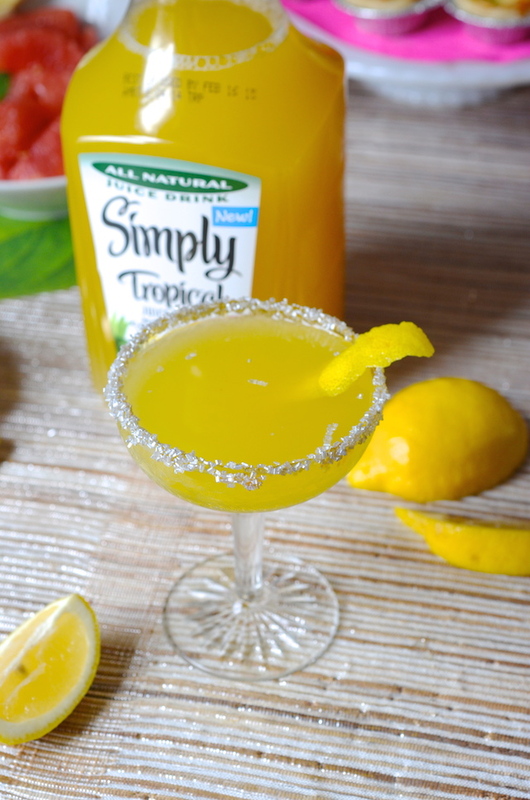 The sweet Simply Tropical has delicious fruity hints of mango and pineapple that worked beautifully with some fresh lemon juice. I served them in sparkly sugar-rimmed coupe glasses that I made by rubbing the edges with a bit of honey, then dipping into a shallow bowl of sugar. 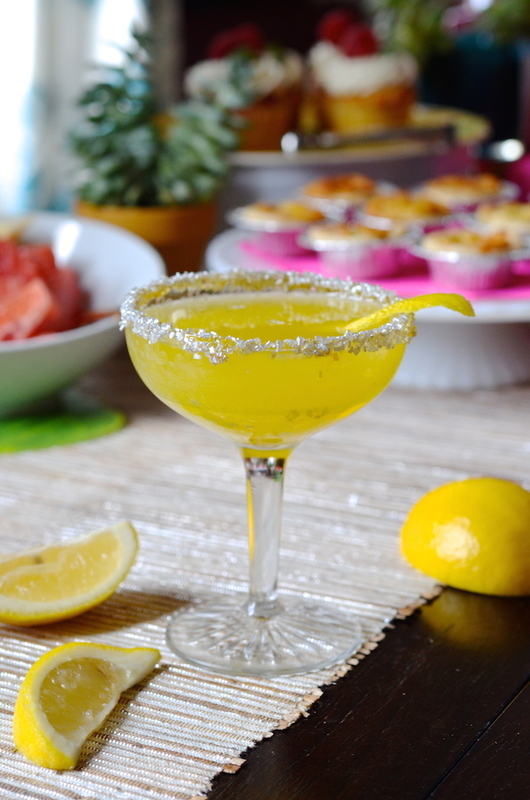 A squeeze of fresh lemon juice and bit of lemon rind garnish completed the drink. If you'd like it fizzy, you can also add a bit of soda water right at the end! Simply Fruit Punch is definitely my favorite of the three new flavors! Made with all natural ingredients and real sugar, it tastes like a fresher, more sophisticated version of the kind we drank as kids. 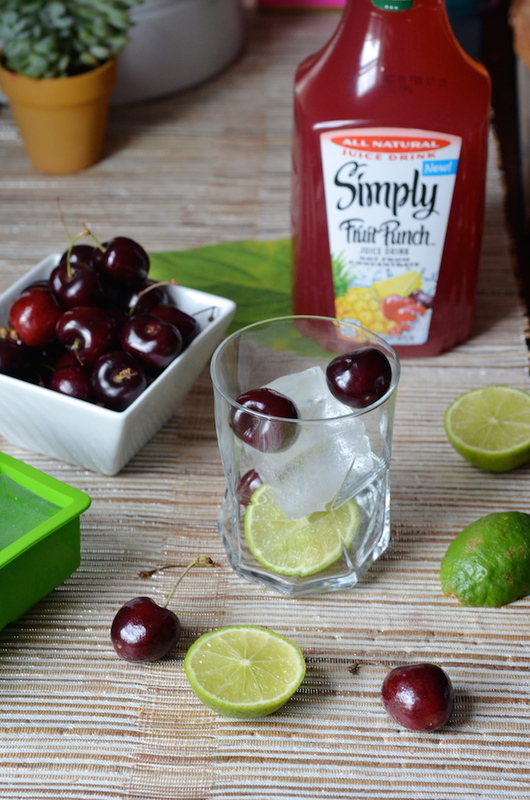 To highlight the cherry flavors in the punch, I added fresh cherries and thin lime slices to my glass. I also used giant ice cubes (made with a special silicon mold) to keep the drinks ice cold without watering them down. It adds an easy, but unexpectedly elegant touch that your guests will love. I hope these ideas inspire you to do the same at home! To learn more about these new juice drinks or to get more serving ideas, visit the Simply Orange page on Facebook. And let me know in the comments...which of these flavors would you like to try first? 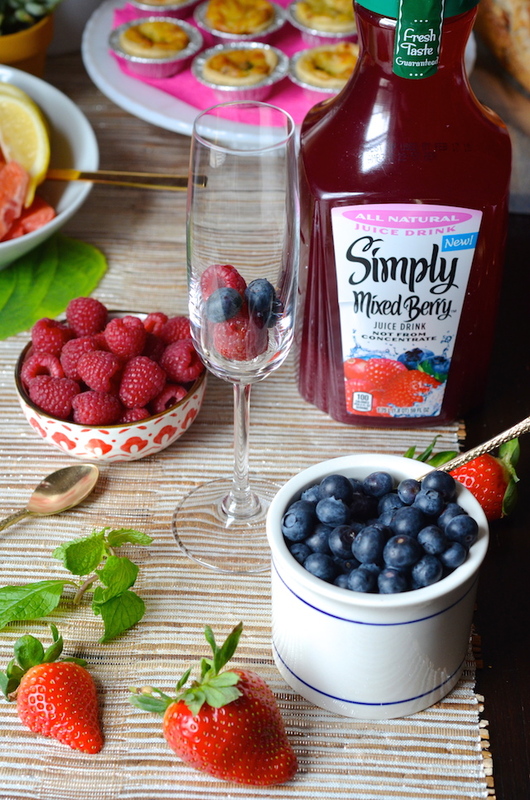 This is a sponsored post on behalf of Simply Beverages, however, my opinions, recipes, and ideas are totally my own. I only work with companies that I genuinely use and love. Thanks to them--and you!--for making all this possible.